Pure Dancing with the Stars » DWTS Season 25, Week 6 – Dancing by the Numbers! Prev Page DWTS Season 25, Week 7 – Who’s Dancing What…and When? Welp, this is one of those weeks where I’m really not sure what’s going to happen…but it will probably be an eye-opening week. We’re going to find out what Drew and Frankie (and Victoria) are made of, most likely. Why? Well, I feel like all of them are probably solid vote getters, but we really don’t know for sure that that’s true. One of those three is most likely to go home, IMO, because there is a pretty big break between the upper tier and the bottom tier scorers this past week. Check it out. 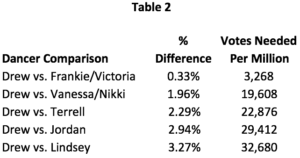 Note the five points between Frankie/Victoria and Nikki/Vanessa. Interestingly, I think the strongest actual dancers are above the break and the weakest dancers are below the break – coincidence? The judges could be playing a dangerous game, though, because my gut says that Drew and Frankie are two of the stronger vote getters this season. I have NO read on Victoria at all; part of me says that she’s fading into the woodwork thanks to unimpactful dances, but the other half of me wonders if Val has enough juice for her to be safe. And a third part wonders if the on-going presence of Maks hurts Val, splitting the C-boy votes. No idea…but I think we’re about to find out. So Drew is low man on the totem pole but only by one point…which is a tiny margin. One that he might be able to beat. As you can see he only needs about 3,300 more votes per million votes cast to beat either Frankie or Victoria, but 19,700 more votes per million votes cast to beat either Vanessa or Nikki. That’s a fairly sizable number these days on DWTS. I would be inclined to say think that Vanesssa or Nikki were the most likely ones to be on the bubble, but with that margin?? I dunno, I don’t think so. I have to say that I have no idea what’s actually going to happen, and that’s fairly unusual. We’ve gotten pretty good at guessing who’s going to go home over the years this show has been on, but this season is a bit unusual…and this week is odd in that the most likely eliminees are pretty well protected. Well, that’s not that odd, they manage to do that nearly once a season – protecting their favorites. It’s interesting that Nikki is up there as I don’t see her as a producer favorite. Drew needs to get 32,700 more votes per million votes cast than Lindsey. I feel like there’s no way that Drew touches Lindsey, Jordan or Terrell, so they are likely safe, with no problem. I think it’s somewhat unlikely that his beating Vanessa or Nikki…but I can’t rule it out. As I said, I think those two were next on the chopping block, if not for their higher scores. But nearly 20k votes? Oy veh. As for Frankie and Victoria? Well, I feel like he’s beating Victoria, but not necessarily Frankie. But I have no idea. Let’s say that Drew beats someone, that would leave Frankie and Victoria on the bottom. What do they need in order to be safe? Yeah, the story isn’t much better for them than it is for Drew. They need about 16,400 more votes per million votes cast to stay over either Vanessa or Nikki. :::sigh::: I just don’t know. Let’s see if we can narrow it down. If you had to pick between Vanessa and Nikki, who do you think is getting ONE vote more than the other? I’m going to pick Vanessa getting the vote mainly because she has Maks and has been slightly more impactful recently, including getting a better running order position. So, I’m going to add Vanessa to the safe group. If you had to pick ONE person between Frankie and Victoria, who do you think is getting the one vote more than the other? Even this is hard. I think Frankie as a celeb is more popular than Victoria, but Victoria has Val. Make no mistake – this is a test of Val as much as it is Victoria. If Victoria had Derek, there is no question she’d be safe. I don’t think Val has the same pull. I’m going to pick Frankie. That would mean that Frankie, Vanessa, Terrell, Jordan and Lindsey are all safe, leaving Drew, Victoria and Nikki in Jeopardy, with one of them going home. Nikki does NOT get 13,100 more votes per million votes cast than Lindsey. So, are all of those things happening?? I’m having trouble with the 19k and 16k votes that the people below her on the leaderboard would have to get; much larger margins have been beaten on this show, but I just don’t think it works this time. So, I feel like Nikki might be safe. It’s also possible that people aren’t voting for her so she falls below the folks below her…but I dunno. I’m going to say it’s either Victoria or Drew, with Nikki at the outside for elimination. I can think of arguments for any of them to be safe…it’s just too close to call better than that. Whoever gets it right this week will have made the very definition of a lucky guess. What’s your guess? 45 responses to "DWTS Season 25, Week 6 – Dancing by the Numbers!" I’m thinking it’s a double (George Pennacchio hinted at this on twitter) with Victoria and Drew leaving. I agree if it were only one person leaving it’d be Victoria as I think Frankie is staying well ahead of her in votes and Drew is passing her. I tend to believe Nikki is doing better than Vanessa in votes and I doubt they’d do the double this week if both brothers were in danger. And like you I doubt anyone is touching Jordan or Lindsey so yeah. I do think if Drew is really that popular with the demo 23k more than Terrell would be nothing since he seems less popular than most of the people left, but being last called safe might give TO a boost. I think these contestants are too close in likely fanbase plus ability – makes it very tough to call, whether it’s a single or a double. I really do think the general public has latched onto Lindsey, Jordan, Frankie, and Drew more than the other four. That’s who I’ve been seeing get by far the most love from the “casuals” in the demo. This week it’s just a matter of HOW much more popular Frankie and Drew are. I get the feeling that at least Frankie is beating Vanessa and maybe TO/Nikki this week despite the large margins but not quite as confident about Drew, especially because he’s a little lower on the leaderboard. I’m going be bold and confidently say right now that both Drew and Frankie will be safe as both will pass Victoria, Nikki, Vanessa and probably TO as well. Both of them for me are pulling the vast majority of “general audience/demographic votes” along with Lindsey and Jordan. Frankie has emerged as an “underdog” and a true fan favourite, Drew is one of the biggest fanbase ringers you can get for DWTS with the overlap of DWTS and Property Brothers viewers. He reminds me of Bill Engvall and perhaps David Ross last season. Not to mention the little snipe from Len almost goading viewers to vote for him. I think he raked them in on Monday night. Does Victoria pass Nikki & Vanessa? My instinct says yes, I agree she has gone a little under the radar since MMY night, but she has an inspirational story which always leaks votes on this show, she was called in jeopardy and Val does have one of the biggest personal fanbases on the pro cast. So I’ll call her safe as well. I agree with you Heidi in that I think Vanessa beats Nikki. She had a far better running order slot, her pro has a bigger personal fanbase than Nikki’s and let’s not forget they’ll be a lot of Nick voters tossing their support to her with him gone. I also don’t think Nikki gets the votes to pass Terrell, his dance was more memorable, of course he got that 10 plus he was also in jeopardy. So in conclusion I think it’s Nikki who goes. She didn’t dance badly at all, but got the coffin slot, was called safe early and I think she’s getting the lowest amount of general audience votes. I don’t think her fanbase is reliable enough to save her either like it did earlier in the competition when she had to make up small margins against low hanging fruit. She’s in that unfortunate position of having a fanbase where many of them are kids/teens/young adults (all unrealible voters on DWTS) and many of them are spending their Monday night watching something else (RAW) therefore forgetting to vote. If Monday is a single elimination I feel confident in saying it’s Victoria going home. If it is a double I keep going back and forth on who I think would join her in going home. I have never been so conflicted in regards to who else would be going home in the situation of a potential double before. Because I feel like Drew is so popular with the demo that he can overcome the vote deficit. But I feel like they wouldn’t do a double if Vanessa was in trouble because sending both C Bros home. But then I feel like Nikki is doing okay with votes.. And TO has that point cushion and he’s picked up some fans since MMY week so does it keep him safe.. so many different variables. The only thing I know for sure is I think Lindsey, Jordan, and Frankie are safe. As for everyone else I think it could go a lot of different ways depending on the type of elimination. If it ends up being a double.. it will be a freaking guessing game as to who goes. If it’s a single I feel pretty confident in saying Victoria. She’s not connecting as well with the demo and her scores were not great this past week. I don’t believe Drew touches other fanbase ringers, but he’s one of the bigger ones THIS season. He doesn’t come close to Alfonso or Donny Osmond, to name two off the top of my head. 16k is nothing, usually – people have beaten 45k vote spreads in the past – but those days are gone and one season doesn’t really compare that well to another. Just because David Ross beat Heather…that says nothing about Drew, Frankie or the others this season. David was likely one of the larger fanbase ringers…much bigger than Drew. One thing that may slightly hurt Drew is fans feeling he really deserved to be lower in scores. That nine from Shania was more than generous, as was the 10 for Terrell. I think we all know which couple should win.But–will they? It’s a tough call but I’m going to have to say Victoria. She does have an inspirational story but out of everyone left she seems to fade into the woodwork more so than any of the others. Vanessa has her Maks/skirt/kids drama, Drew is one of the bigger stars this season and has a very outgoing personality, Frankie has surprised people and taken the role of the underdog, Terrell has improved the most, Nikki has also improved and been scoring well recently and may have a decently sized fanbase. I’d rather see Nikki continue over Victoria because she seems to have more surprising dances. Since season 19 Val has made it into the finals except season 21 but was still very close. It is probable they may want to keep him around till at least the half way mark or so. If it’s not Victoria then I think it may be Frankie. Then again, now that Nick is gone how invested are people in Vanessa? I think she will stay for a week or so because she has Maks but she is not totally out of the question. So overall I’m going with either Victoria then Frankie then an outside chance of Nikki. I hope drew and nikki goes home or drew and vanessa if its 2 people going home or if it’s only one person I hope its drew because he can’t dance. Thing is, Holly, that all those seasons Val made the finale he had big ringers with some level of dance experience. Plus, the producers really helped him out with the pimpage and the over scoring. I thought for sure that was the route they were going with Val again this season as recently as week 5…but this week they’re close to the bottom. That means one of two things: the early pimpage has worked and they know Victoria will be safe regardless this week, OR they’ve decided that others are more important this season (either because they’re going on tour OR because others are getting so many more votes that the writing is on the wall). Great numbers post Heidi! I agree, it’s a toss up between the three you mentioned. I have never liked Nikki much, so, I’m going with her leaving this time. I’m also in agreement that Victoria’s performance, at this point, have got her becoming lost in the shuffle amongst the other contestants unfortunately-which I find so sad b/c I, sincerely, do like the girl and love her backstory. She really is an inspiration but paired up with Val who either has not done enough to challenge her or can only do so much to challenge her, she just doesn’t stand a chance of lasting. Question is-how far will his fanbase take her? A few things I keep thinking about: Nikki and Drew came to the show with a decent fanbase, Victoria did not. I don’t know how strong Vanessa’s might be or even Frankie’s. Maks was not able to save Heather, but the vote was really more about her and Alan. I’m not sure who will get the nice guy, having fun, 4th place between Drew and Frankie. I think that factor keeps them safe this week. So, given all of this, I think Victoria goes home. Val did not get the win for a ringer last season. I also think that the show is questioning why Val, with all the advantages given him, cannot deliver. I think Laurie could have won with any pro. Drew and Nikki both came in with decent fanbases. The big and imo decisive difference is that Drew’s fans are made up of largely over 50s who likely already watch DWTS. You can always rely on that demographic of fans to vote in numbers and that has been proved historically. Nikki’s fans are largely made up of female kids/teens/young adults who likely do not watch DWTS (in fact most of them watch a Wrestling show that airs on the same night) and are historically not to be trusted in a tight voting situation. That’s my logic anyway. I started out thinking Victoria will be the one eliminated and I still think so, but after reading the post and PH’s thoughts about the break, and who’s above/below it, along with rumors of a double elimination, I got wondering about what TPTB could be angling for. Frankie made some mistakes this week, but Drew probably deserved a better score than he got. It does feel like they are the two who’ve made a good connection with the voters, so could it be that TPTB can live with one of them making the final but not both? Because both of them making the final would mean either Lindsey or Jordan would fall short. So maybe we’ll see a double elimination if the results left them with an opportunity to eliminate one of them along with Victoria? #Gunny that is a very good point about Maks and Heather-completely forgot about the fact that even his fanbase wasn’t enough to save her so even Val’s fanbase, for sure, may not be enough to save Victoria…. I’m not sure how much of a role twitter and instagram followers take determining vote count, but Victoria only has 17k followers on twitter and 47k on instagram, whereas Frankie has 250k and 134k (same order as before) and drew has close to one million on both. Since Victoria’s numbers are so much smaller than everyone else’s I would think that may put her at a disadvantage from a voting standpoint? As far a who’s going home, I am clueless. I see lots of double elimination speculation…is this a possibility tomorrow? I think it’s a close call between Victoria, Nikki and Drew. Because of Drew’s Pro partner, Emma, the reigning champ, and Property Brothers popularity it could keep him safe. As for Nikki, I think she may have a fairly descent fan base due to her wrestling career, but is Artem’s fan base big enough to give her the edge. And, for Victoria, she actually probably had the lowest fan base of these three, and Val is not impressing me at all with his choreo. And, like others have mentioned, he splits the C bros fan base votes up with Maks. I would have thought that Terrell would be gone by now in the beginning of the season; but, he sure has improved and Cheryl has done great with him. I also have to say that Frankie had his breakthrough also; and with his attitude and Witney doing a good job he could be around a while longer. So, I also agree with PHeidi on these three being too close to call. This season’s finale should have 4 couples (as has been the usual case with the fall seasons in recent years). Drew and Frankie could both make the finale without knocking Jordan or Lindsey out. Right now I feel pretty confident that if it’s a single elimination, Victoria is the one to go. Her dances have no been impactful, she hasn’t had a wow moment, and I don’t think her disability is resonating with viewers the way it has with other contestants (maybe because you can see it?). It’s a shame because I do like her, but she’s just falling through the cracks. If it ends up being a double, things get interesting. Like you note, Heidi, Drew and Frankie both are connecting and probably doing well in votes. The main question is do they have enough juice to make it past the others? I think they might. I actually think Nikki is getting the one vote to beat Vanessa, leaving Vanessa as the most vulnerable. My gut is that Vanessa is the other one to go, but I have a hard time believing TPTB would send both Val and Maks home the same week. If Vanessa is safe, I think it’s a toss up between Frankie and Drew. Frankie has definitely won a lot of hearts, but I do think the really harsh comments last week for Drew really helped him. If Vanessa isn’t the second one, my next pick would unfortunately be Frankie. Honestly though, unless Jordan or Lindsey goes home I won’t be surprised by any elimination. #22 IMO Drew and Frankie SHOULD make the finale. Are TPTB gonna leave their hands off of it and let it happen organically? I dunno, Chayse – I think the urge to make big headlines is greater than their urge to keep a C-boy safe. Hard to say. And the elimination of both Maks and Val on the same night might be a temptation too big to resist. One thing that Val and Maks both have is a publicist willing to make hay on their relationships – a double elimination would be cake for her. I’m dyslexic, Christina. You put your mind to it and work hard, you can do anything. I totally sucked at math in High School, but something clicked in college. Never give up. I don’t think Maks voters are hurting Val’s chances of helping Victoria get further on in the competition but the other way around. I think C-bro voters are voting more for Val than Maks. Solely based on last week, I think Vanessa and Maks will be eliminated. I can’t remember their dance AT ALL. Frankie and Witney’s dance was…”interesting” to say the least, but in fact memorable for all the wrong reasons, which may have caused some viewers to vote for them. This would be a perfect time for Nikki and Artem to leave, as I don’t see her improving any more or showing any different sides to her or her performances. For me, I’m content with Nikki or Vanessa leaving, the latter more so. As long as TO and Cheryl #teamgetchapopcorn are SAFE. Then, im happy lol. He is GROWING on me A LOT! I never think the producers mess with the viewer votes – too much risk and if they were caught, it could shut down the show. They are not below doing whatever they can to manipulate the vote. It is easier to manipulate the judges who get half the score. Since the judges make over a million dollars a season, they will do as they are told – after all, this is just a tv show. They know the top two and I’m not sure they care in what order the others fall. I do think they wanted Val to be the new Derek, but not even close – even dating a troupe member didn’t help him (haha). So, I don’t see the judges supporting Victoria over Drew or Frankie. For sure it will be one of the girls and if it is a double, two girls (Nikki and Victoria). I’m probably wrong. Hopefully if it’s a single elimination they’ll call a team safe before the end like they usually do we can narrow it down. If TO’s team is in jeopardy then at least then we’ll know that Nikki’s going. But if Drew’s team is in jeopardy then I’m not going to have a clue who it is to be honest. If it’s double then hell do I know how they’ll do it. The producers can’t mess with the votes obviously, but they can call a double elimination AFTER knowing who has finished second bottom of the leaderboard. That to me is almost just as bad. I’m sure they cover their asses by putting it in the contracts that they can call a double elimination at any time. But that doesn’t make it any better. To be fair though they’ve only ever done it once and that was to get Sean Avery out after his alleged “bust up” with producers. My guess is Victoria if it’s a single elimination and add Nikki if it’s a double. Despite the apparent fan base for Nikki I don’t think it’s enough combined with Artem fan votes to keep her there. I think Victoria has even less of a fan base and Even though Val “appears” to be the big man in the ballroom, it’s just an illusion. Originally I thought Frankie would be top three, but I’m not so sure anymore, his star appeal has deminished faster than I expected and I think Whitney votes will/are saving him. Like most, I think Lindsey and Jordan are a lock for the finals. The other two may very well be Drew and Vanessa. Does anyone know why we had everyone learn 2 dances the 2nd week of competition only to have a double elimination. I thought having the Tuesday night show was because we had 13 couples & the extra night of dancing was for the benefit of no double elimination, but then we have a week with no elimination WHY !! I think it will be Victoria tonight. If double, I have no idea though. Gonna go with Nikki only because I think Artem’s base is smaller than either Emma or Cheryl. Could be Terrell though lol. @ Carol #33: On the night of the Vegas sadness, there was no elimination. Of course, another element to look at as a factor for making the finals: which pro is doing the tour. TPTB will want their top finishers to be on tour as a draw. (Mark already has a tour to go on with Lindsey, but TPTB will want to stay on good terms with Mark for Season 26) As for one of their partners going on tour like Rashad, I don’t know which one will be available. Frankie might be, but with his health problems, I don’t think he or TPTB will want to take the risk. I personally will hope for a double C-bro elimination tonight. Now that will be a good shocking elimination! TPTB: can we have a treat rather than a trick? Has anyone heard anything more about Lindsey? George of ABC is saying they don’t know if she will continue in the competition due to her rib injury. If not, then I guess it will be a savings grace, most likely for Victoria. I don’t think they’d do a double elimination tonight. I think it’ll be next week only because I can see TPTB wanting as many couples as they can get for TRIO week since they are pulling in past celebs for the trio dances. So, maybe they want to include as many couples as possible to increase viewers and ratings?? I’m posting this at 5:50pm EDT. Just seeing articles that Lindsey may not be able to dance. Would that mean she would be the automatic elimination this week, or would they go ahead with tonight’s and have the double elimination be that person and Lindsey? I sure hope she can dance! But EmnEm if they don’t have a double elimination tonight, that means if they do trios next week they’ll have to get through 14 full routines in a two hour show. There’s no way they can make that happen. So one of two things is happening IMO, either they’ll pull a last minute double elimination tonight or they’ll do trios in the semi finals and have the double elimination next week. Option two for me is by far the most fair and least shady of two, which means of course they’ll do a double elimination tonight and have trios next week. If they do have a double elimination then I’ll truly feel sorry for whoever goes after finishing second bottom in votes even if it’s a Chmerkovskiy as they will have literally been victims of a producer screwjob. Lee(2), just saw the dance lineup and Lindsey is in it so fingers crossed. Let’s hope she’s not one of the two if there’s double tonight because that would pretty much be the end of the season for me. That’s it! I finally. 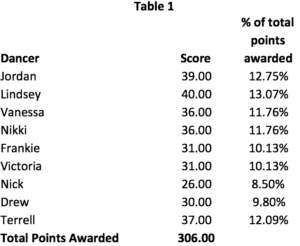 Have the answers…the Russians are interferring with DWTS voting process and results. So, question is… who on the inside should be indicted??? LOL….no, wincing..
My hope is that Victoria and Vanessa go tonight. For no member of the fam to make it to the finals (or anywhere even close) is just too good not to hope for. Maks keeps saying that they have something big in the works. I’d love for them to go away and do whatever it is and get off my tv. Praying that Lindsey S. isn’t hurt too badly. If not for the competition then for her tour that starts right after. They HAVE done 14 routines in a two hour show before…it’s just very unpleasant.